Think contouring is just for beauty pros and Kim Kardashian? Well, think again, because this nan is about to school you all. 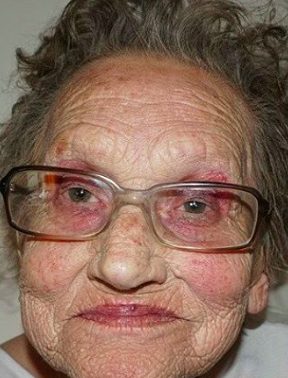 Known as ‘contouring grandma’, 80-year-old Livia has gone viral after her granddaughter – makeup artist Tea Flego – shared before and after photos of her (pretty unbelievable) makeup transformation. Obviously, Livia became an internet sensation practically overnight – with her latest transformation gaining over 23,500 likes. And it’s not hard to see why – she looks amazing. Her granddaughter has actually been posting transformation photos of the 80-year-old for quite a while, but the latest has only just taken off. The 80-year-old is now known as ‘contouring grandma’ or ‘glam-ma’, and her look has – according to Tea’s Instagram – inspired her nursing home friends to try out contouring for themselves. To be fair, if I lived at the same nursing home as Livia, I’d want to look like her too. The real question is though, when will Glam-Ma get her own Instagram? We’re hoping soon.